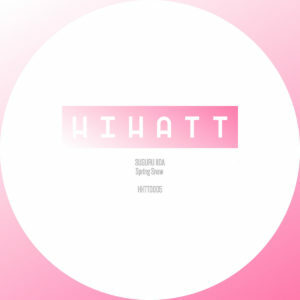 Last year, the fledgling Hihatt label released the Rubber Band EP from Tottori producer Hajime Iida. It was a late calendar release, so it sorta snuck under our ears for a bit, but it’s a fantastic EP of understated house music, highlighted by the breezy strut of “1” and the more hurried rumble of “3.” Based off of info written on Bandcamp, Iida has a little brother named Suguru who also turns out to excel at making fragile dance songs drawing from the softer side of the Chicago sound. “Spring Snow” moves in no rush, slowly unfolding and revealing new details that add a richness to the song. Wait for the changes in percussion to join the synth melodies and beat, or those slightly wonky notes to bend in midway through. Or how the whole song flips midway through, somehow getting more skeletal and a touch more fragmented…but then switching back to this calmer stroll. Get it here, or listen below.